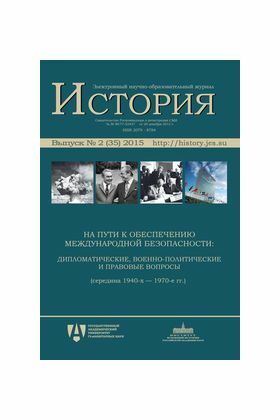 The present issue of the Journal consists of the articles, based on new documents of the Russian and foreign archives, which examine various episodes of the Cold War history and give a complex picture of both failed and successful attempts to reduce the level of confrontation between the two opposing social and political systems for avoiding the danger of nuclear war. The authors raise problems of beginning and development of the nuclear arms race and the struggle for its limitation, address the issues of European regional security. Particular attention is paid to the analysis of political and economic factors that contributed to the deténte of international tensions in the late 1960's — mid-1970's. Studies of discussions on the law of the sea and the Soviet policy at the UN Commission on Human Rights highlight the activity of the United Nations. The issue is addressed to experts in the field of international relations and all who are interested in the history of the Cold War. obtained by the Institute of World History RAS.